We are so painfully close to spring. The feel of soil between your fingers, the sight of familiar bulbs popping up in the garden, and the chirp of your neighborhood birds – all the welcome signs of spring are almost within reach. But not just yet. We’ve still got a few more weeks to weather out. Thankfully, there are snowdrops to remind us that spring is just around the corner. These lovely bulbs arrive as early as January, peeking out from beneath frozen ground to give us our first taste of springtime. Long before daffodils and crocuses make their debut, snowdrops keep the garden bright and fresh. Once the springtime sun starts to heat things up, they disappear. But they stay around just long enough to officially usher in the season. Naturally pest-resistant. Snowdrops produce Galanthus nivalis agglutinin (known as GNA). The substance repels pests, making the snowdrop a particularly hardy bulb. They’re even naturally resistant to groundhogs, deer and rabbits! Researchers have attempted to introduce GNA in other plants to replicate this effect. Nice to know snowdrops can fend off predators without any assistance from you. Alzheimer’s and dementia treatment. One of the active ingredients in snowdrops, galantamine, is commonly used to treat early Alzheimerís and vascular dementia. The substance facilitates brain function and is sometimes a treatment for patients who have suffered brain damage. You won’t experience any health benefits from eating a snowdrop petal or bulb, however-they’re poisonous! Full of surprises. Don’t be shocked if snowdrops pop up in random sections of your garden where you never planted them. They spread easily! Not only that, but they are quick to hybridize between species. This means you’ll wind up with all kinds of interesting cross-breeds, each with a slightly different appearance. Garden perfume. 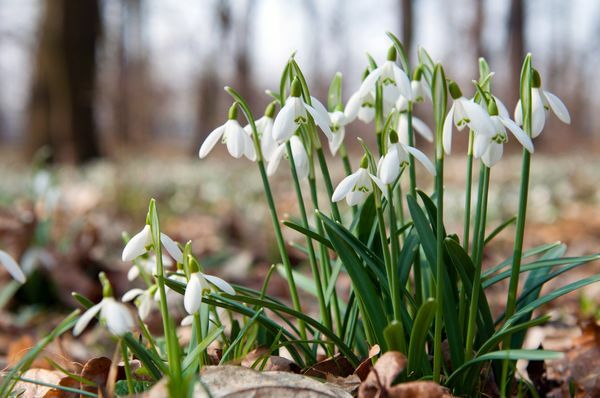 When the sun peeks out, snowdrops emit a honey fragrance that’s strong enough to fill your whole garden. The scent of spring before the season’s even begun!